Hambleton District Council has launched a new recycling service in a bid to significantly increase the range of materials being collected for recycling - and decrease the amount of waste sent to landfill. The new service sees the range of items picked up at the kerbside increased through a new co-mingled service using a wheelie bin and a box. 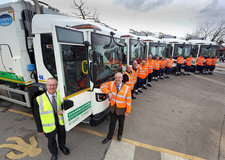 And it is collected using a new fleet of Refuse Collection Vehicles (RCVs). In June 2015 the authority awarded a new ten year contract (with an option to extend for an additional ten years) with long-standing vehicle partner, Specialist Fleet Services Ltd (SFS), to supply and maintain its entire fleet for waste collection, recycling and street cleansing services. The new vehicles are already in service across North Yorkshire including Northallerton, Bedale, Thirsk, Stokesley and Easingwold. Additional vehicles, including more RCVs, sweepers, vans and a mobile crane, will be delivered as part of a planned replacement programme. “This new service is already seeing an increase in the amount of recycling we are collecting – we have been staggered by the amount left at the kerbside and by the quality,” said Leader of the Council, Councillor Mark Robson. Householders across Hambleton have been issued with a black wheelie bin with a blue lid where they can put mixed recyclables - including paper, cardboard, steel and aluminium cans, plastic food and drink bottles, plastic rigid containers (such as food pots, tubs and trays), waxed cartons, foil and aluminium food trays. Glass is collected separately in a blue box.